In keeping with my rainy theme this week... 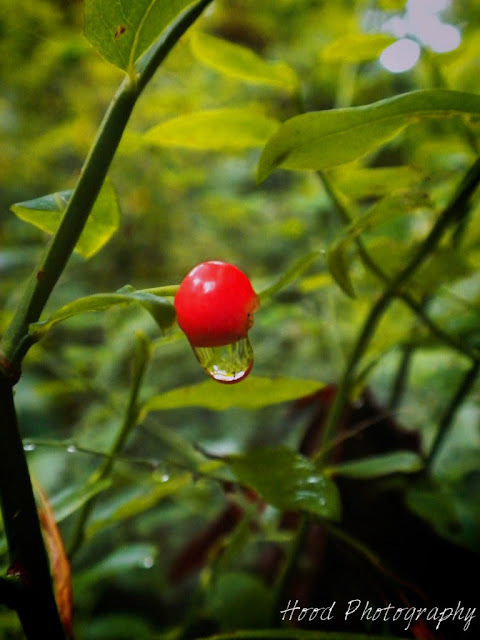 While hiking last weekend, everything around us was dripping wet. You could not help but notice the huckleberries on the edge of the path. This one in particular caught my eye because of the perfect water drop just getting ready to let go. the fruit looks interesting by itself. I wish Colorado would get the rain the PNW is getting. Brenda – my WW is here. Brings back memories of hiking in the rain in the PNW. And oh how I miss the huckleberries. Excellent capture at just the right moment. I have never seen a huckleberry. But this has got to be the best one ever!